Grease does not attract dirt. Grease is not polarised and does not act like a magnet for dirt. 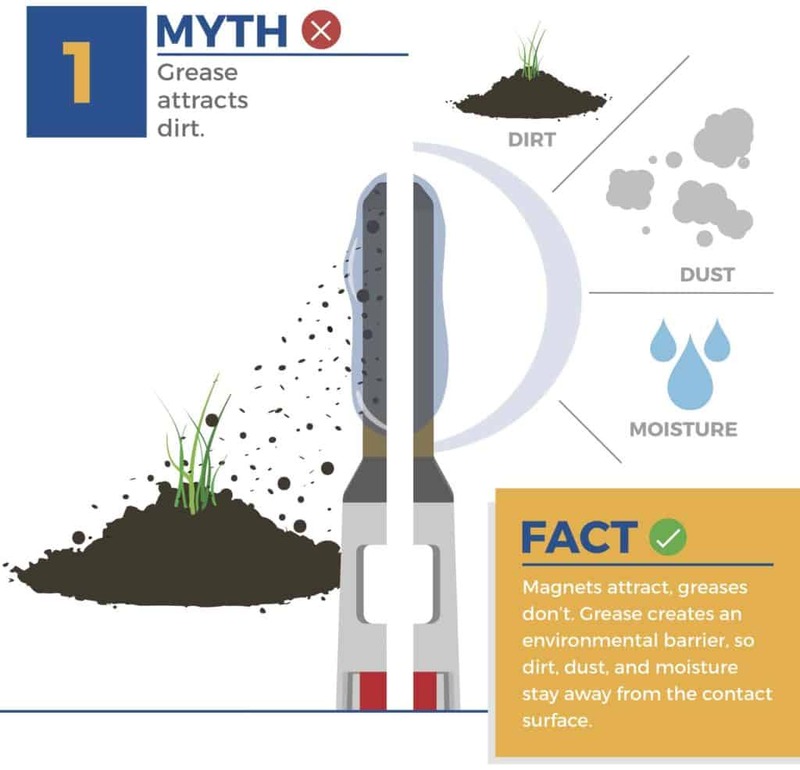 Sure, if dirt lands on top of grease it will stick there, but that’s one of the reasons for using a connector grease, as a protective barrier……the grease will protect the contact area from contaminants, be that oxygen, hazardous gases and of course debris/dirt. If dirt lands on top of a connector grease, it will not burrow down or penetrate through the grease to the contact surface. A connector grease is not being worked like a bearing grease, it’s static or stationary. Maybe there are a few un-mating and re-mating actions for a connector during the connectors functional life but it is unlikely a dirt will find it’s way between the contact surfaces unless there is some neglect involved. Take a moment to study the graphic shown above. A correctly formulated dielectric connector grease will not insulate, nor will it conduct. Think of the two contact surfaces like two jagged mountain ranges coming together. The current flows where the various mountain peaks of the two contact surfaces touch. These mountain peaks are referred to as Asperities or sometimes called A-Spots for short. When the mountain ranges or contact surfaces come together there are lots of microscopic gaps or valleys (if you want to continue the mountain range theme). Think microscopically, not what you see with the naked eye. So the grease sits in the valleys or gaps between the mountain peaks and so current flows as normal, there is no increased resistance across the connector. Where applied, grease will environmentally seal the surface of that area. 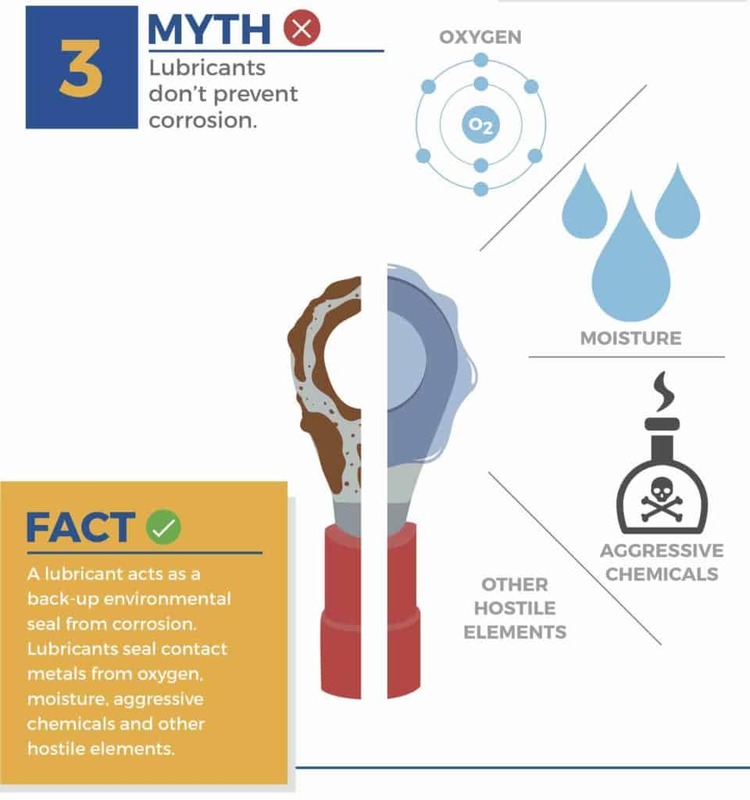 The grease will act as an environment seal, protecting the contact metal from oxygen, moisture, debris and other contaminants so that corrosion will not occur. 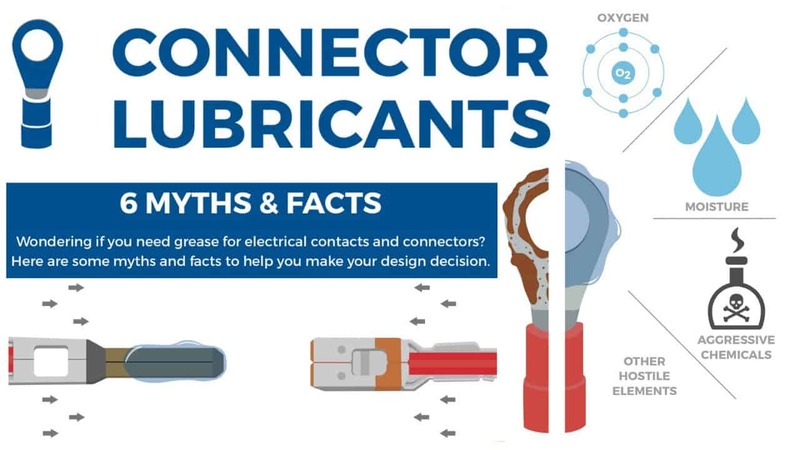 Some our connector lubricants can even deal with hostile conditions, resist hazardous gases and some acids. Our Perfluoropolyether (PFPE) based grease range is suitable for extreme environment applications. Take a look at this histogram below. 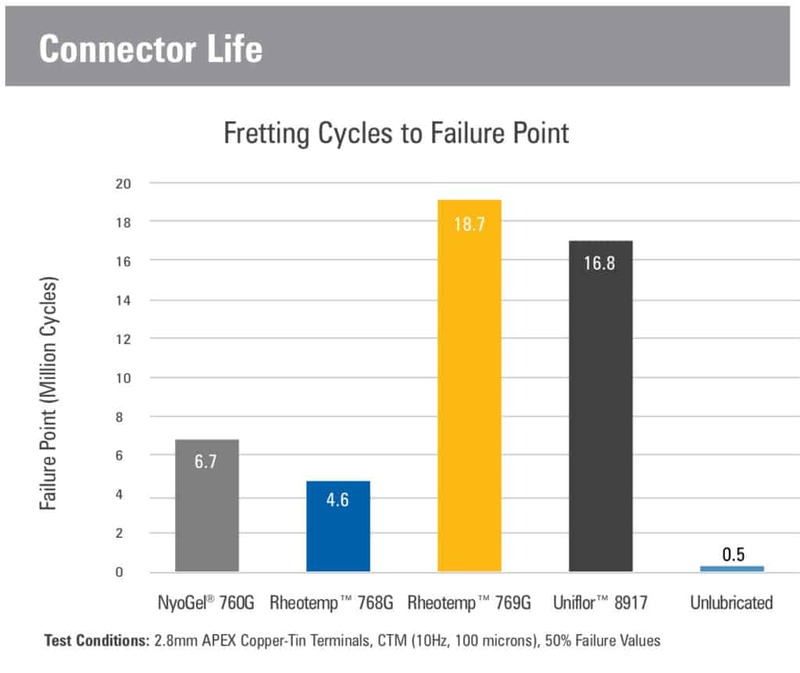 This was a benchmarking exercise for our core range of connector lubricants. 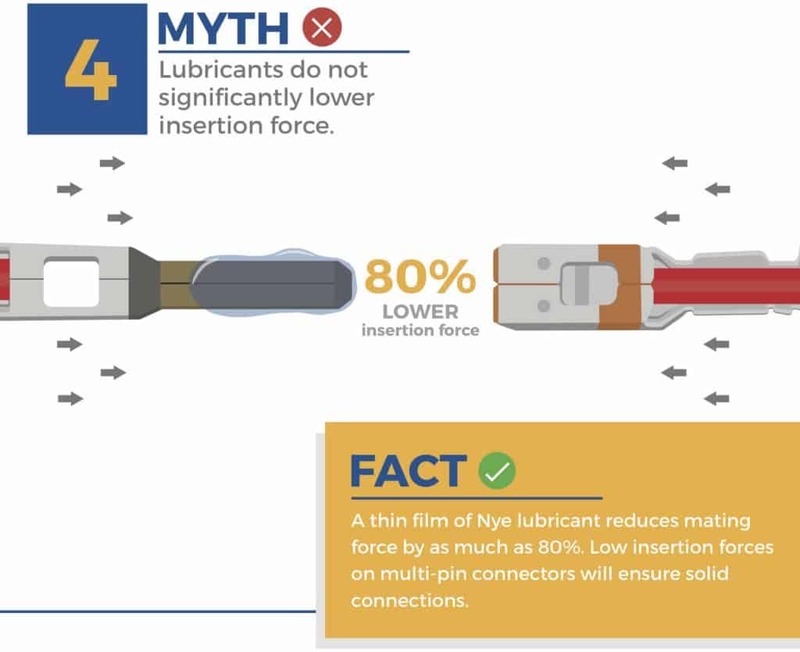 Compare the insertion force required between unlubricated connectors versus lubricated. This graph shows average force for 10 insertions. Note that insertion force measurements were taken for just the one insertion and of course the subsequent nine. 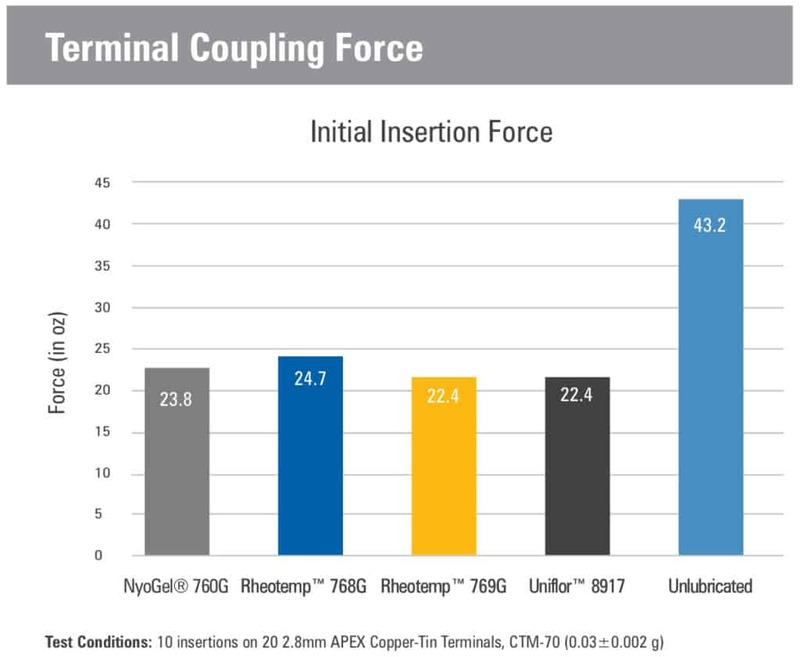 Look at the difference insertion forces readings for the first insertion, especially the difference between unlubricated in grey and our best performing insertion force reduction grease in blue called Uniflor 8917, the difference is huge. USCAR mentioned on this graphic relates to the United States Council for Automotive Research. 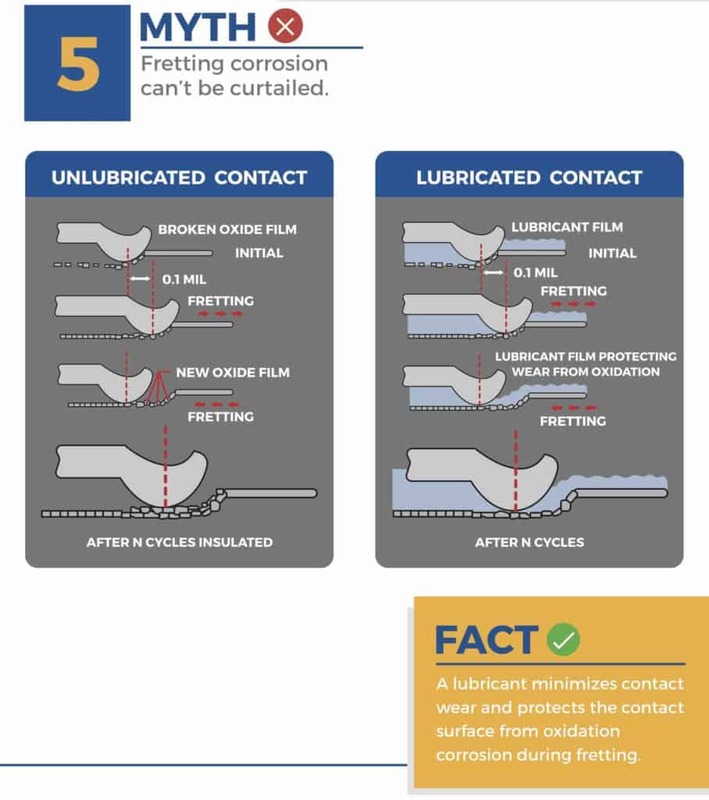 The graphic above that illustrates the fretting wear and start of the fretting corrosion process. You can see on the Unlubricated Contact graphic we are talking about fretting movements of .1mm on the graphic or even smaller. The debris that builds up is most likely very small, almost dust like. Once the fretting and oxidation process takes hold, the condition of the contact surface will deteriorate. An application of a specialist dielectric connector grease will prevent fretting corrosion and oxidation problems. 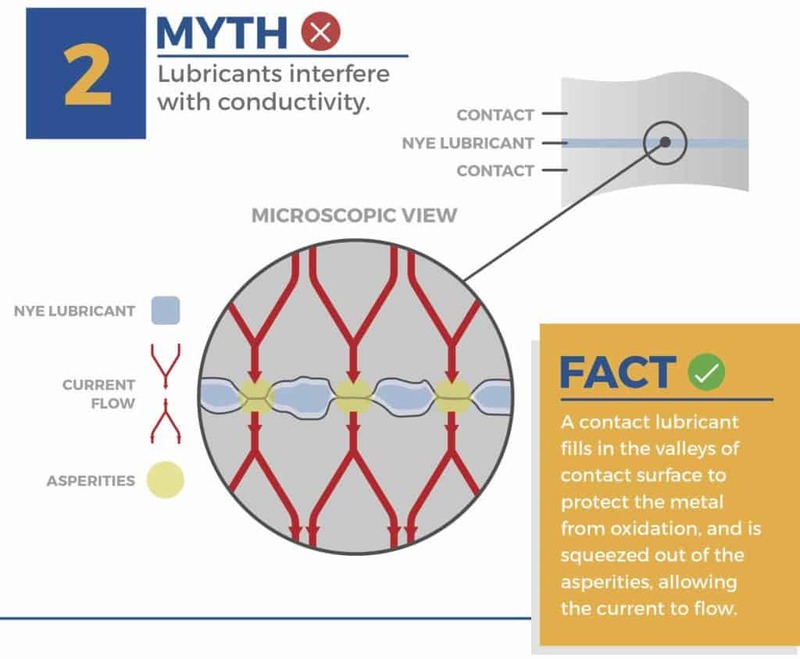 The Lubricated Contact graphic above illustrates the lubrication of any movement or fretting in the connector. The presence of the grease also protects the contact surface from oxygen, moisture and any contaminants, so oxidation cannot take place. Above we have a graphic with a comparison or benchmarking test showing the fretting prevention performance in respect of most commonly used connector lubricants. You’ll see that that the test was performed on a number of tin plated copper contacts at 10hz, 100micron movement. Results vary depending on contact metal type, temperature, surface topography and other factors. If you want to know more about fretting wear and corrosion prevention, we an article and video about this subject. Gold plating is microscopically porous. 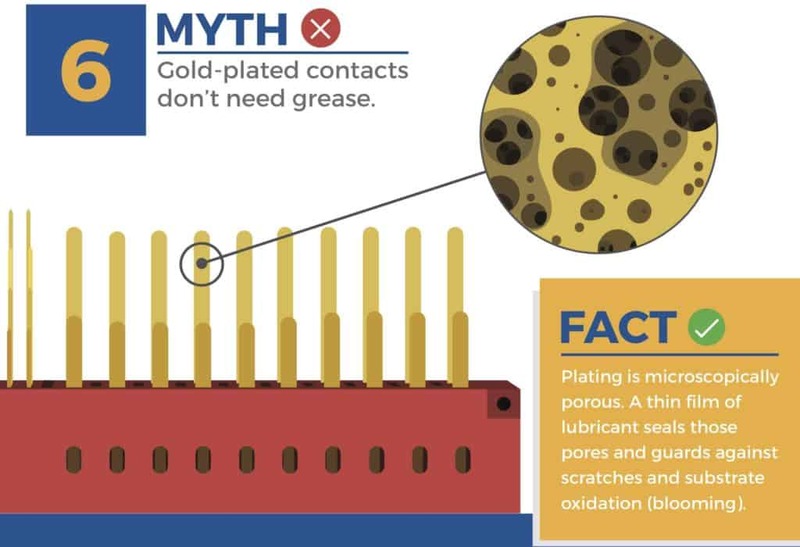 The application of a grease environmentally seals the surface and so seals the pores, guarding again substrate oxidation and crucially protecting the gold surface from scaring or scratching during connector mating; this is especially relevant where a thin gold plating has been specified to help prevent fretting but the contact forces are very high and so when that first mating of the connector or contact surfaces is performed, the gold plating is scratched away, negating the whole reason for investing in gold plating in the first place. The subject of connector contact force is a tricky one, too little contact force and the chances of fretting occurring are increased, too much contact force my also contribute to fretting due to the aforementioned mating damage that could be inflicted on the contact surface during insertion/connection.